Not content with dazzling us on the pitch, Barcelona superstar Lionel Messi has now done it off the pitch too. The 31-year-old has been in incredible form so far this season, scoring 29 goals and providing 17 assists in just 29 appearances across all competitions. 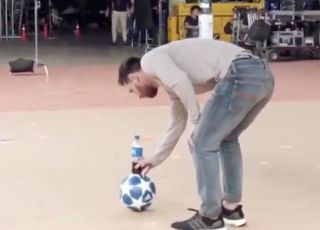 However, his class isn’t just restricted to the pitch, as seen in the video below where he produces a ridiculous bit of skill while filming a promo with Pepsi. While the majority of mere mortals struggle to do a bottle-flip with our hand, Messi has taken it a step further and done it while involving a football.